Note: this page is under initial construction. The attached sketches are -- obviously -- merely a beginning. See also Fr. Kino's Visits to the San Pedro River. 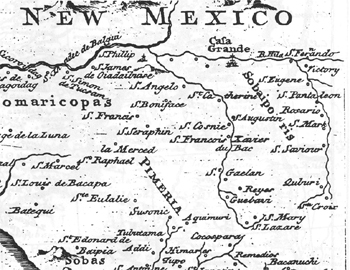 The second map, below, was compiled by Nicolas de Fer and published in Paris in 1720. This is one of a number of pirated copies of Fr. Kino's original manuscript maps, and is quite close to Kino's orginals, including lists of village names (though de Fer, a French cartographer, was better valued for his decorations than for his accuracy, and he made mistakes on his maps). 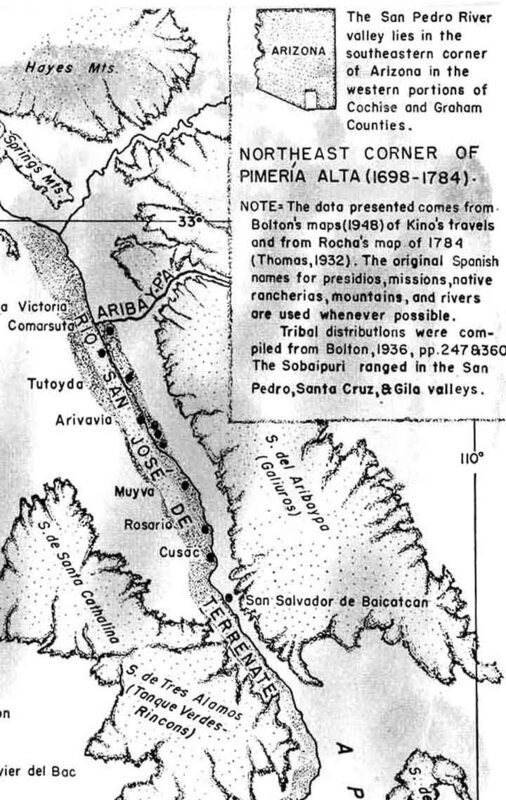 The third map, below, was compiled by Charles Di Peso (1953), basing his list of places on Herbert Bolton's work (and Di Peso's own archaeological studies). 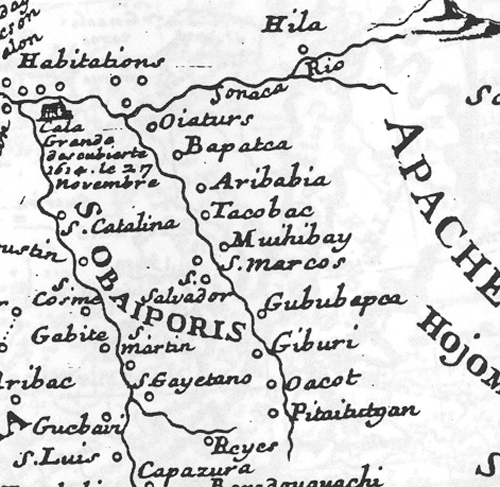 This map shows "Quiburi" (Giburi, Cuburi) as located near the later mining town of Fairbanks (and where Di Peso excavated), while "San Salvador de Baicatcan" is placed somewhere between the Redington area and Cascabel:. 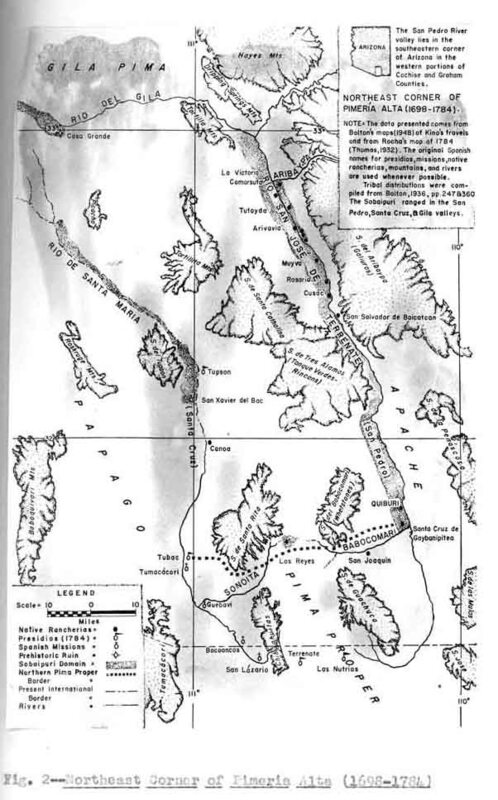 This map, which corresponds to Father Polzer's later map in his 1981 book, presumably represents his mature views on the locations of these Sobaipuri Villages. 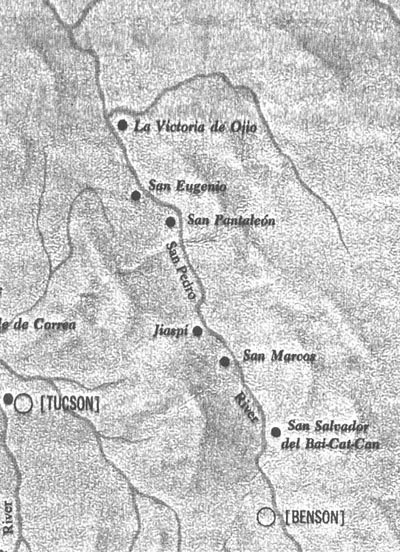 In this model, San Salvador del Bai-Cat-Can was located near the Tres Alamos Wash, San Marcos near Cascabel (on the West bank), and Jiaspi near Redington (also on the West Bank). 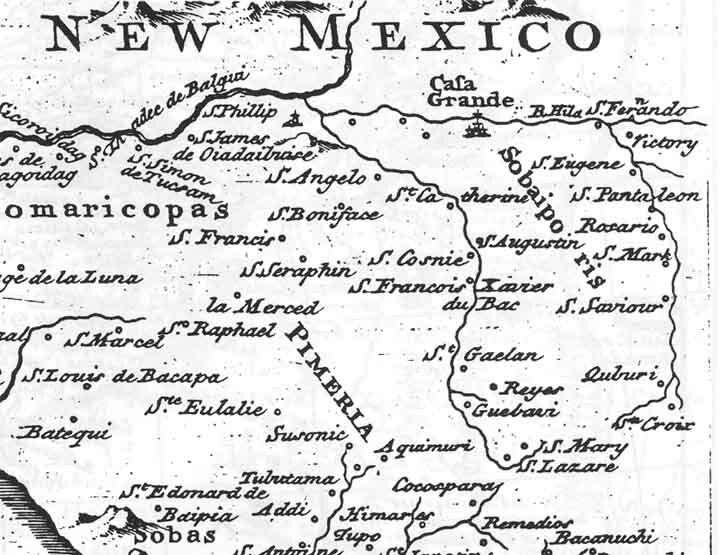 San Eugenio was placed near the present-day intersection of State Hwy 77 with the San Pedro, and La Victorio near the mouth of the Arivaipa Stream.